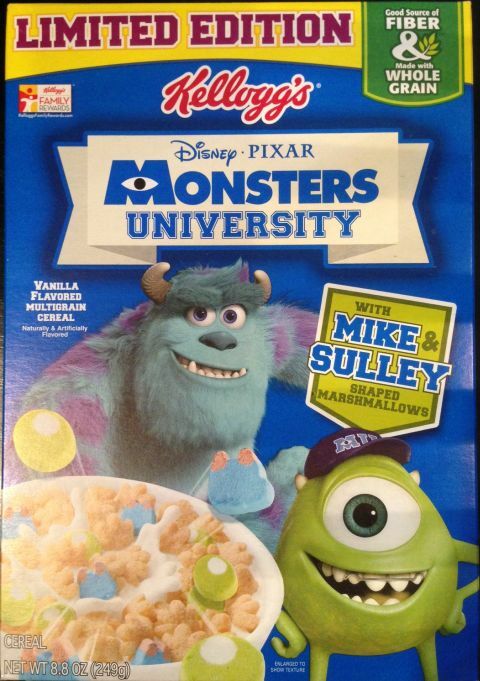 Just in time for the movie we get Disney Pixar Monsters University Cereal which is a vanilla multigrain cereal that has marshmallows shaped like Sulley and Mike from the movie. This will be a limited edition cereal but it looked pretty neat. I think they did a good job with both monsters in marshmallow form, with Sulley’s head being the better of the two. They also did not do anything crazy with the cereal just sticking to the “we know this works, just throw marshmallows in it” type of cereal. While we are all looking forward to the Monsters University movie, I am sure our kids will be happy to see the Disney Pixar Monsters University Cereal in their bowls as well.